Cartoons of the Muslim propher Mohammed published in a Danish newspaper have caused riots in the Middle East (the cartoon is at left). 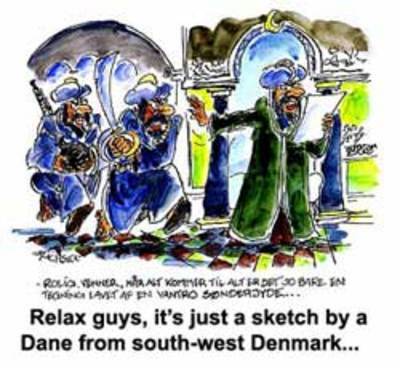 Last autumn, the Danish daily newspaper Jyllands-Posten published a dozen irreverent cartoons of Mohammed, as "a test of whether fear of Islamic retribution has begun to limit freedom of expression in Denmark." The cartoons were reprinted a few days later by a Norweigian daily. In response, a number of leading European dailies published the cartoons in solidarity with the threatened newspaperk. Die Welt, Berliner Zeitung, La Stampa, El Mundo, NRC Handelsblad, Corriere della Sera and France Soir were among various European media who decided to publish the pictures, or create their own cartoons of Mohammed. The editor of France Soir, a once-huge Parisian daily tabloid now struggling with declining readership, published the cartoons -- saying he did so to show that "religious dogma" had no place in a secular society. Under the headline "Yes, we have the right to caricature God", France Soir ran a front page cartoon of Buddhist, Jewish, Muslim and Christian gods floating on a cloud. 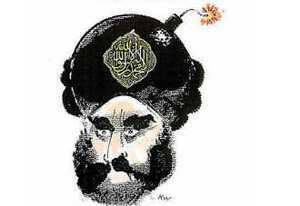 It shows the Christian deity saying: "Don't complain, Muhammad, we've all been caricatured here." After which, the editor was fired by the publisher. Now, "a Jordanian gossip tabloid has just defiantly published three of the cartoons. that have triggered outrage in the Arab and Muslim world," reports Deutsche Welle today. "'Muslims of the world, be reasonable,' said the editor-in-chief of the weekly independent newspaper Al-Shihan in an editorial alongside the cartoons, including the one showing the Muslim religion's founder wearing a bomb-shaped turban. 'What brings more prejudice against Islam, these caricatures or pictures of a hostage-taker slashing the throat of his victim in front of the cameras or a suicide bomber who blows himself up during a wedding ceremony in Amman?' wrote Jihad Momani.He told the Agence France Presse he decided to publish the offending cartoons 'so people know what they are protesting about... People are attacking drawings that they have not even seen.'" Although Muslim doctrine forbids paintings showing the human image, this has not always been universally observed in Islamic countries. There was, for example, an important tradition of Shi'ite art dating back many centuries depicting human beings -- examples can be seen today in mosques and public buildings in Isfahan, for instance. And while depicting Mohammed's face is supposed to be "blasphemy," his face has frequently been represented in Islamic countries. with a veil to hide certain of his features. Moreover, a Muslim journalist of my acquaintance says that in his travels he has collected "pious" images and post-cards of Mohammed as a child, an adolescent, and as an adult in various Islamic countries, including Pakistan, Iran, and and the Arab Emirates. That there have been visual depictions of Mohammed throughout Islamic history can be confirmed by a visit to the enlightening Mohammed Image Archive. It is to be noted that the public protests and street demonstrations are hardly universal in the Islamic world. There have been none to speak of in the country with the world's largest Islamic population, Indonesia. Nor have their been in Turkey, inheritor of the Caliphate empire (the Caliphate was abolished by the Turkish dictator Kemal Attaturk in 1924). No, the large and violent protests have largely been confined to Libya and the Arabic countries of the Middle East (Saudi Arabia, the Emirates, Palestine) -- and these are all countries which have been repeatedly criticized in the West for purveying anti-Semitic charicatures and defamations, like that infamous forgery and hoax, the "Protocols of the Elders of Zion." There is, therefore, not a little payback and hypocrisy in these protests. What's really going on here is an attempt to extend to the West the kind of theocratic censorship that Islamic fundamentalists enforce by intimidation or law in countries from Morocco and Algeria to Iran, Afghanistan, and Pakistan. 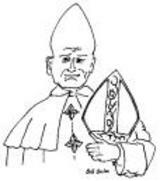 There is a long and rich tradition in Western countries of caricatures of religious figures and leaders, including Jesus himself (example at left). Of course, we are not exempt from attempts to censor cartoon images (for recent examples here in the U.S., see the website of the Comic Book Legal Defense Fund.) Most recently, as The American Thinker usefully pointed out today, Washington Post cartoonist Tom Toles has been the target of a Pentagon attempt at censorship. We need to continue to defend the right of irreverence if we are to be free people. One should be able to make fun of Mohammed or the Pope or any other religious figure without having one's life threatened or being subject to theocratic censorship. And I, for one, whatever the Islamic fundamentalists say, will continue to eat Havarti cheese or play with my Lego toys (Danish products both) any time I like! You can read a different, longer, and more recent version of the above on Open Democracy by clicking here. P.S. More fundamentalist censorship in the Islamic Republic of Iran: Reporters Without Borders yesterday condemned the imprisonment of Elham Afrotan and six other journalists employed by the provincial weekly Tamadone Hormozgan, who were arrested on January 29 for “insulting Ayatollah Khomeini, the founder of the Islamic Republic” and who face heavy prison sentences if not the death penalty. To read about this theocratic censorship, click here.